Sri Lanka’s road to attaining Test status has been documented on several occasions in books and by way of articles written expansively in the newspapers. But for the first time a Sri Lankan domiciled in Australia has decided to present it on DVD format. The 120 minute DVD titled “Legends Who Helped Sri Lanka To Gain Test Status” is a comprehensive documentary, which includes interviews of most of the living legends who made a significant contribution to Sri Lankan cricket. The author Alston Mahadevan has taken great pains to get interviews and comments from 24 of Sri Lanka’s pre-Test cricketers who give a vivid description of the key matches played as well as the players and presenting the viewer a clear picture of how the country attained full membership of the ICC. “The background and the reason for the production is that I like most Sri Lankans grew up with a passion for the game of cricket and started collecting newspapers, magazines and books from the early 1960s and now have a comprehensive collection of over 500 books and many cricket DVDs,” said Mahadevan. “After becoming a member of the Australian Cricket Society (NSW) nearly 7 years ago, my involvement with them made me understand the importance of continually producing materials relating to cricket. I feel Sri Lanka lags behind the well-established nations in relation to the availability of books and other materials relating to the history of Sri Lankan cricket. Even though we are equally competitive on the playing field, we have very little material available to highlight our history,” he said. Mahadevan said that he was inspired by the documentaries produced by the Australian Broadcasting Corporation and the BBC on the history of cricket and used them as his guide to maintain the same standard and quality. “The reason for producing a DVD instead of a book is that while a book can be produced anytime, as our living legends are getting older, it is important to record the history in their own words,” said Mahadevan, an old boy of St Anthony’s College, Kandy and an accountant by profession. 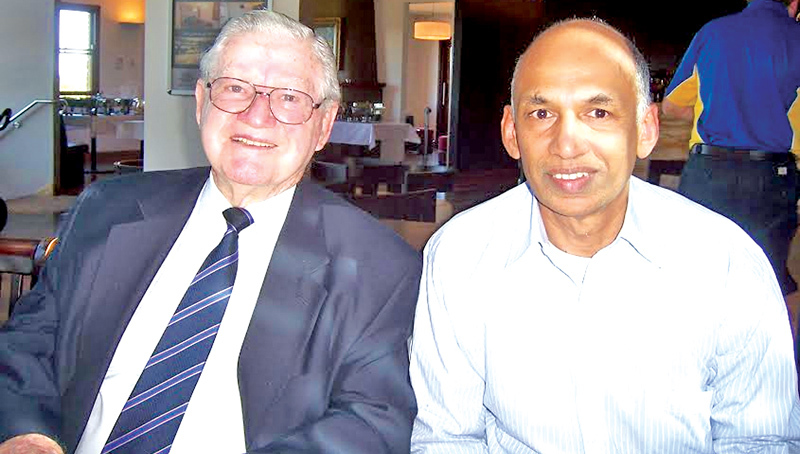 “I managed to record the history from the 1930s when Ceylonese gradually started to dominate the Ceylon teams with the help of Bertie Wijesinha who played alongside the greats of the 1930s for SSC. I interviewed nearly 25 players in total and the DVD covers up to 1982 when we played our inaugural Test match,” he said. What stands out are the interviews he’s had with past Sri Lankan cricketers like Bertie Wijesinha, the oldest living Sri Lankan cricketer. To see them express themselves like so many others in the DVD adds life to the production. The entire production from the script, narrating, interview questions, editing and the funding has been totally by Mahadevan who is a fully qualified member of the Institute of Chartered Accountants (Sri Lanka), Chartered Management Accountants (UK) and CPA Australia (Certified Practising Accountants). He was employed at Ernst & Young (Colombo) from 1977 to 1982 and also worked at PwC in Lusaka, Zambia and Alcan Aluminium in Auckland, New Zealand before migrating to Australia in 1993. He is at present living in Sydney and working for the Ministry of Health as a Management Accountant for nearly 24 years. The final touches to the DVD has yet to be put by Mahadevan who expects to have it ready for sale by sometime early this year. “I would like the past cricketers to benefit from the proceeds received from the sale of the DVD and functions which will be organised to promote the DVD,” said Mahadevan who has also spoken to Sri Lanka Cricket president Thilanga Sumathipala and how they can help him to acknowledge the contributions made by the legends of Sri Lankan cricket. To the present day generation of cricketers and cricket followers who know little or nothing of the pre-Test era of how cricket was played by Ceylon (when it was then known) this is a wonderful educational guide. Having got the opportunity to get a sneaky preview of the production one can easily state that it is an absolute gem. It is one that should be at the home of every lover of cricket whether Sri Lankan or otherwise. I was given a copy of this DVD yesterday. I watched both hours yesterday itself. Since I either knew or had watched most of the cricketers personally, I was enthralled by the detail Mr Mahadevan has gone through to compile this incredible video record of All-Ceylon and Sri Lankan cricket. Thank you Alston! I encourage any true-blooded cricket fan and support the cause of looking after the cricketers of the older generation, who weren't fortunate to play the game professionally.